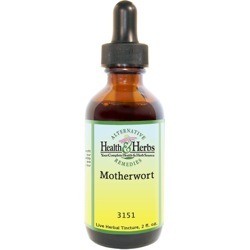 Motherwort is a wonderful support herb for women's health, easing menstrual cramps, PMS and the symptoms of menopause. But it is also a great relaxant that helps to alleviate stress, depression, anxiety and nervous disorders. Used for centuries as a calmative and nervine that induces passivity in the whole nervous system, and alleviates hysteria and palpitations of the heart. It is also said to be an effective painkiller that eases headaches, and a sedative that helps to treat insomnia. As a tranquilizer, it is thought to be good for tremors, convulsions, and delirium. It is also believed to decrease thyroid function, but the plant brings balance and helps to alleviate the symptoms associated with a hyperactive thyroid. Motherwort herb inherits its name from the application of use as a plant for pregnancy, birth, motherhood, and menopause. Motherwort's use in pregnancy can also put a pregnancy in danger of termination, so be very careful if you are pregnant or seeking to become pregnant. Women who tend to have a menstrual cycle that comes on slowly and have other symptoms of PMS such as anxiety, digestive disturbances, cramps, and nervousness, have seen great benefits with the use of this herbal remedy. As an antispasmodic, it relieves stomach and menstrual cramps. It is good for other "female troubles," by encouraging and easing uterine contractions during childbirth and as a painkiller, easing the pain of childbirth, and menstrual-related headaches. After childbirth, it has been used to tone and restore uterine health and may help to reduce the risk of postpartum bleeding. It is strongly indicated as an herbal remedy for postpartum depression. This organic herbal tincture is also quite useful throughout motherhood, in easing the stress of children as they cycle through difficult phases. It is said to balance hormones and help in the relief of the discomforts of PMS (premenstrual syndrome), as well as the unpleasant symptoms of menopause. It can aggravate heavy bleeding, so if you are prone, use it sparingly. Conditions of the heart and nervous system have been treated historically with Motherwort, as history tells us it is considered a cardiotonic as well as a nerve tonic. Due to the presence of the chemical alkaloid leonurine, a mild vasodilator, it acts as an antispasmodic to relax smooth muscle, and the heart is made up of smooth muscle. Studies performed in China found Motherwort to decrease clotting and the level of fat in the blood. Motherwort was also found to decrease clotting and the level of fat in the blood. With its calming effects, it may help to slow heart palpitations and rapid heartbeat. Mildly diuretic, it also aids in lowering high blood pressure, and most effective when it is a symptom of stress and anxiety. There is nothing subtle in the effects it has on the nervous system. Motherwort "gladdens the heart" and relaxes the nervous system, which can result in elevated mood, relief of nervous debility and spasms. Higher doses are said to work as a sedative to improve sleep. Because one of the main symptoms of hyperthyroidism is heart palpitations, many herbalists believe that Motherwort leaf may be helpful in treating the condition. Hyperthyroidism may also lead to infertility if it is not taken care of. Motherwort plant extracts have also been shown to aid in conditions with fever, where there are delirium and sleeplessness. As an antispasmodic, it has also been used for rheumatism and lung afflictions such as asthma and bronchitis. Ingredients: Motherwort, Structured Water, 20% Alcohol. Non-Alcohol: Motherwort, Structured Water, Vegetable Glycerin. Contraindications: Pregnant women should avoid Motherwort, as it stimulates uterine contractions, but it may be used during labor. Those who have heart conditions should not use this herb without the advice of a physician. Motherwort may produce allergic reactions to those susceptible to dermatitis. It is not recommended for people with clotting disorders, high blood pressure or heart disease without first consulting a physician. Women who have a family or personal history of cancers that are linked to higher levels of estrogen, including breast and uterine cancer, should consult a physician before using Motherwort.